Heard so much about Denmark’s infamous music festival but simply too far away to witness it yourself? Now you can do this with Roskilde – The Experience 2008. These set of movies aim to bring the feel of the festival towards various audiences from across the globe. 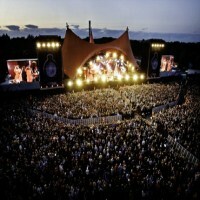 Roskilde is among the top five most popular festivals held in Europe. The other four include the Glastonbury Festival, the Sziget Festival, Rock Wechter and the Paléo Festival. The films about Roskilde are created by Per Tore Holmberg and begin with the 2005 festival and up. Roskilde – The Experience is a set of movies done in order to capture the feel of the festival. Every single film is done full HD so fans of the festival and those looking to experience it, can easily grasp the moment. The festival itself has actually been around since 1971 when it was first started by two students. Pretty soon a Roskilde Foundation took responsibility for manning the organizing of the festival each year. Every year, Roskilde is usually held for about 4 days and features a variety of musical acts. The movie itself captures what the festival is like, from the music to the crowd. Each part of the movie/documentary is like a mini-reminder of what it was like being in Roskilde for that particular festival year. It also serves as an ode to the festival makers themselves. So far there are four movies done (2005-2008) and each one is available in different formats for easy access. All of these are offered for free and for non-profit so grab a download link and experience Roskilde in the comfort of your home.